The Raymond Carver Reading Series in the College of Arts and Sciences continues with a reading by acclaimed novelist Dinaw Mengestu. On Wednesday, Dec. 2, Mengestu will participate in an audience Q&A session at 3:45 p.m., followed by an author reading at 5:30 p.m. Both events are free and open to the public, and take place in Gifford Auditorium. For more information, contact Sarah Harwell G’05, associate director of the M.F.A. Program in Creative Writing, at scharwel@syr.edu. 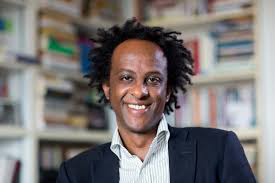 Mengestu is the author of the critically acclaimed novels “All Our Names” (Knopf, 2014), “How to Read the Air” (Riverhead Books, 2010) and “The Beautiful Things That Heaven Bears” (Riverhead Books, 2007). The Ethiopian-born writer is also a frequent contributor to Rolling Stone, The New Yorker, The Wall Street Journal and Harper’s Magazine. Mengestu teaches English at Brooklyn College and Georgetown University, where he has held the Lannan Foundation Chair of Poetics. He has received major awards from the MacArthur Foundation, National Book Foundation and the New Yorker. Named for the legendary fiction writer who taught at Syracuse during the Eighties, the Carver Series brings 12-14 prominent writers to campus each year. The series is organized and presented by the M.F.A. Program in Creative Writing in conjunction with an undergraduate course called “Living Writers” (ETS 107). Both the program and course are housed in the Department of English.